In him we have obtained an inheritance, having been predestined according to the purpose of him who works all things according to the counsel of his will, 12 so that we who were the first to hope in Christ might be to the praise of his glory.13 In him you also, when you heard the word of truth, the gospel of your salvation, and believed in him, were sealed with the promised Holy Spirit, 14 who is the guarantee of our inheritance until we acquire possession of it, to the praise of his glory. Growing up, I wanted to be so many things—a policeman, a racecar driver, and an architect. What did you want to be when you were growing up? Oh, the good days, where the sky was the limit to our wildest dreams! It’s interesting that even at a young age, there’s this underlying question driving all of us: what is the purpose of my life? 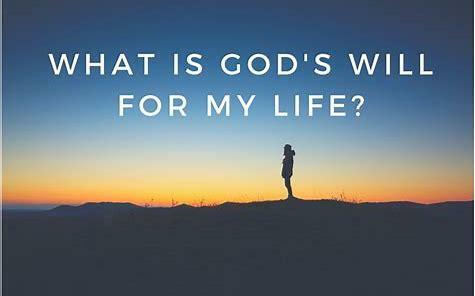 And as believers, we tend to rephrase it as, What is God’s will for my life? Yet it’s a question that brings more frustration than motivation for many of us. Every major step we take, we wrestle with the question: Is this God’s will for me? In today’s passage, Paul has an answer for us. Those who have been chosen by Him have been also predestined according to the purpose of him who works all things according to the counsel of his will. Notice that Paul writes, who works all things: not just the good things in our lives, but also the things we may consider bad. In fact in Romans 8:28 Paul assures us “that in all things God works for the good of those who love him.” But if we’re not careful, we may use verses like these to justify the bad decisions we make. God doesn’t necessarily justify the bad things in our lives; instead, He chooses to redeem them for a greater purpose beyond our understanding. While the specifics may be unclear in the moment, one thing we know for sure: He wills so that our lives may be for the praise of His glory. It is both humbling and freeing for us, and yet it also brings us the utmost confidence, for this promise is given to those who have been called by Him and love Him. Rather than being paralyzed with this question of what is God’s will in our lives, we can put our trust in Him—that in all things He is working for our good. Whatever season we may be in, know that He is doing something good. Our job is to be faithful to what He is doing now. May we continue to obey and follow after Him! Prayer: Father, we thank You that You see the greater picture of our lives. Though we only see a glimpse, I pray that we may be faithful and obedient to where You have called us now. Holy Spirit remind us and assure us that nothing can thwart God’s will being done in our lives. Amen. Read Joshua 5:13-15: When Joshua was by Jericho, he lifted up his eyes and looked, and behold, a man was standing before him with his drawn sword in his hand. And Joshua went to him and said to him, “Are you for us, or for our adversaries?” 14 And he said, “No; but I am the commander of the army of the Lord. Now I have come.” And Joshua fell on his face to the earth and worshiped and said to him, “What does my lord say to his servant?” 15 And the commander of the Lord’s army said to Joshua, “Take off your sandals from your feet, for the place where you are standing is holy.” And Joshua did so. Additional Context: After this encounter, God reveals the plan to conquer Jericho. God commands them to march around the city once for six days. Then on the seventh day, they were to march around the walls seven times. On the seventh time, God commands them to shout and that the walls would fall down flat. Imagine yourself in Joshua’s position, hearing God’s plan to overtake this formidable city of Jericho: How would you respond? How did Joshua respond? How does worship give Joshua the confidence to submit to His plan? When God asks you to do something, what is your response? What are the areas where you are refusing to submit? The Scriptures are filled with God revealing some of the most ridiculous and extra-ordinary plans. Yet for those who receive these plans, it is in the place of worship that enables them to submit to God’s will. In worship, Joshua is able to submit to God’s will. Joshua comes before the Lord with his face to the earth. This teaches us that worship begins with our humble submission to the Lord. God also commands Joshua to take off his sandals, since he was standing on holy ground. Worship drives us into the presence of God and His presence sets us apart. In His presence, we are able to find confidence in His plans over our own. Oftentimes, we tend to put more weight on our logic and reason. This does not mean we should make decisions rashly, but we should allow faith to always drive our decisions more than our logic. Personal reflection. Reflect on the passage above. The psalmist reminds us that life is a journey and not simply a destination. We are reminded that God cares more about the process than the actual destination, or as Rick Warren writes: “God cares more about who you become than what you do.” But far greater than this, the psalmist reveals that more rewarding than our plans is His presence. Spend some time reflecting on this. When you come before Him, are you restless to hear some sort of direction? Or do you find the fullness of joy just by simply being in His presence?